In Harmony, you can export you scene as a sequence of image files, which can be played in Harmony Play or imported in a video editing software for post-production. You can export an image sequence in a handful of different image types. If you want to export images with transparency, you can do so by selecting an image type that supports it, such as TGA, PNG or PSD, then setting the Colour Mode to Colour with Transparency. 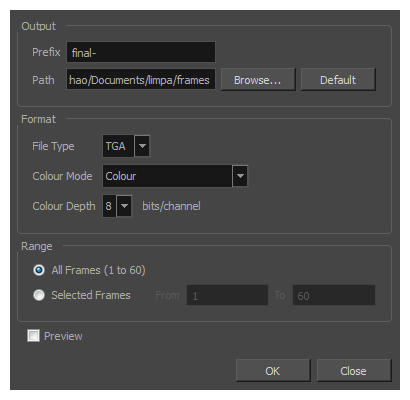 You can also export images with deep colour (16 bits/channel) by selecting a file type that supports it, such as PNG or PSD, and setting the Colour Depth to 16 bits/channel. From the top menu, select File > Export > Images or press Ctrl + Shift + Y (Windows/Linux) or ⌘ + Shift + Y (macOS). Click Browse and select the directory in which to export your images, or click on Default to set the export destination to your scene's frames subfolder. In the Format section, choose the desired image format in the File Type drop down list. Colour Mode and Colour Depth from their respective menus. In the Colour Mode drop down list, select whether you want the exported images to be in Greyscale, Colour or Colour with Transparency. In the Colour Depth drop down list, select whether you want the exported images to be in 8 bits/channel or 16 bits/channel. 8 bits per channel is the most standard colour depth, but 16 bits per channel allows for more colour precision. NOTEMost image formats will export in Colour at 8 bits/channel. Only a few image formats, such as PNG , TGA and PSD, can be exported in different colour modes and colour depths. Enable the Preview option to automatically preview the exported image sequence in Harmony Play once the render is done. Harmony begins rendering the scene's frames. If you enabled the Preview option, the exported images will load in Harmony Play once the render is done. You can user Harmony Play to play the image sequence with the scene's soundtrack.